And Eucalyptus Hey, how did that Koala get in the picture? Reminder that tomorrow is the 15th, time for another Garden Bloggers' Bloom Day. It's easy to participate. Just post on your blog about what is blooming in your garden now, then leave a comment on my bloom day post (which will post very early tomorrow) so we can find you. 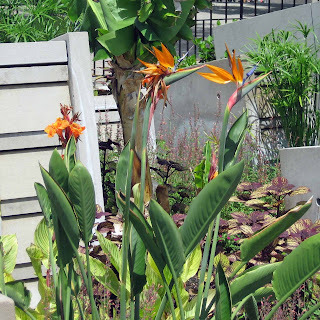 All are welcome to participate, even if you don't consider your blog a "garden blog". Very clever post, Carol! I do the same thing when I go to the Zoo, but it's hard not to when Zoos do such a great job with their plantings. If you can use the koala pic, I vote including a monkey puzzle tree. I went to a new to me zoo a few months ago and I was very taken with the trees, robinias in particular. So I bought three tubes and hope to put them in their permanent spots soon unless they are still a bit small. Fun post! 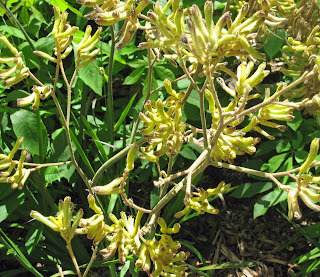 I walked around the St Louis Zoo in May and noticed all the invasives! I drove my husband nuts! 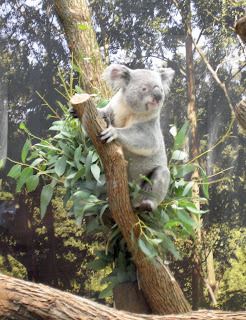 You made it to the zoo to see the koalas! Wow, the 15th has certainly slipped up on me. On a trip to Sea World last summer, all I did was look at the landscaping. Very irritating to my family. I can so relate to this Carol! I spend more time looking at the zoo gardens than at the critters. Very cute post! 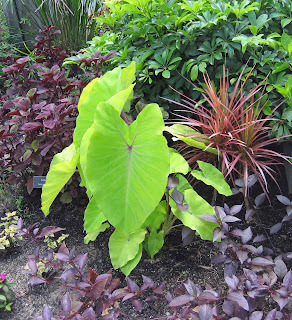 I love that lime colored elephant ear - it is so striking. He ate the eucalyptus Carol. This is a fun post. It looks like you had fun at the zoo. not only does she see them, she takes pictures of them!! Neat! No zebra grass or lion's tail? I just got home from a 3-week vacation to find my blog had been hijacked by a malicious hacker. So my site and email are down, and I'm trying to remain calm while my guru works on it. The last time we went to the zoo, it was just as the bulbs were spent so there were crews in the midst of digging them all up and replacing them with something else. I was so much more enthralled with their process than the animals. Really, a zoo is a fantastic place to see a broad range of plants. I think that I want to work there!